A person who supports or is in favor of terminating pregnancies: Many proabortionists maintain that terminating a woman's pregnancy, although not a preferred family planning method, has always been used by women to gain control over their pre-birth conditions. According to one view of proabortionists, women must have a safe and legal access to stopping their pregnancies because without this availability, women may use unsafe and illegal procedures that can result in serious injuries or death. Either early flowering or the first flower to open of an inflorescence. 1. In all likelihood; very likely. 2. With considerable certainty; without much doubt. 3. Easy to believe on the basis of available evidence. "Before-the-Bactrian lizard" from Early Cretaceous China and Mongolia. Named by Anatoly Konstantinovich Rozhdestvensky in 1966. 1. The act of proving that an instrument purporting to be a will was signed and executed in accord with legal requirements. 2. A judicial certificate saying that a will is genuine and conferring on the executors the power to administer the estate. 3. To establish the legal validity of (wills and other documents). 2. A nurse (or other employee) in training who is undergoing a trial period. 1. The act of exploring or searching with or as if with a device or instrument. 2. To delve into; to investigate. 1. A question or situation that presents doubt, uncertainty, perplexity, or difficulty. 2. A question proposed for solution or discussion. 3. In mathematics: A statement requiring a solution, usually by means of a mathematical operation or geometric construction. 4. Someone who is difficult to deal with. 5. Difficult to train or guide; unruly; such as, a problem child. 6. In literature: Dealing with choices of action difficult either for an individual or for society at large. 7. "No problem", used as a conventional reply to a request or to express confirmation, affirmation, or gratitude. 8. Etymology: "a difficult question proposed for solution", from Old French problème (14c. ); from Latin problema, from Greek problema, "a problem, a question"; literally, "thing put forward"; from proballein, "propose"; from pro-, "forward" + ballein, "to throw". 1. A reference to the doubtful, uncertain, or questionable nature of a condition or a situation: Economic claims for future investments are often problematic presentations that do not turn out to be accurate. 2. Pertaining to a problem; difficult to solve: A repair of Karen's car proved more problematic than first expected. 3. Not settled; unresolved or dubious: Jonathan has a problematic future as a computer expert. 4. 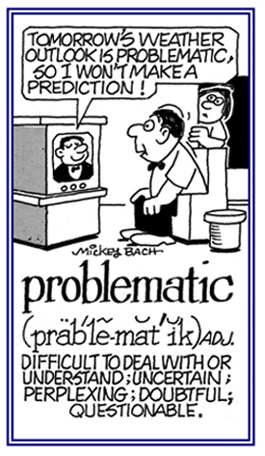 Etymology: from Greek problematikos and from Latin problematicus, "relating to a problem." © ALL rights are reserved. 2. Open to doubt; debatable. 3. Making great mental demands. 4. Hard to comprehend or solve.